Is it possible for one app to turn your Mac into a fully fledged TV studio? BoinxTV has lofty ambitions for itself. Intending to eliminate the need for post-production, it can handle multiple camera feeds and graphic overlays like RSS tickers, weather maps and drawing tools, all in a live output. The immediate caveat is that it won't output HD video or take HDV cameras as a source without downscaling in-camera. Source recognition was excellent, though, and completely without drama. Exporting your video to disk is reasonably speedy (six minutes for a 30-minute PAL recording), but the native QuickTime transcoding is, predictably, not. The shamelessly iLife-esque interface is user-friendly to a fault. Information like the rendering load, audio levels, recording run time and previews of numerous video feeds is all available at a glance. The left side of the screen shows your options for a selected layer and it's here you find things like Chroma Keying, as well as the ability to change the image in graphic overlays, and the option to switch between multiple cameras. To keep things familiar, BoinxTV is based around layers. Higher layers take priority, but can be turned on and off with big, satisfying Live buttons. Do you want to show a recorded film instead of your presenter? Import the video and place it in a layer above the presenter's. When you're ready to play it, just hit the red button. It will then automatically switch back to the lower layer when it's finished. New graphics layers can be created in Quartz Composer and imported into the program to increase the already comprehensive choices. Our only disappointment with BoinxTV's interface is that camera switching is stuck as small buttons at the bottom of a long list. On a live show, you really want big important buttons that can be moved next to the camera previews. It's less of an issue on a 30-inch Cinema Display than on a MacBook Pro, but it's actually a surprisingly large oversight. Sadly, it's not the only one. Boinx loudly champions the ability to stream live to the internet, but on closer inspection you need GrabberRaster (a further £68) to screencast your preview video window and a streaming service to do it. Not exactly a built-in feature. The touted support for Elgato's Turbo.264 HD is hardly seamless either – it requires turning off the built-in transcoder and running a custom AppleScript. Also advertised is the ability to import video from Skype and iChat straight into your broadcast. In fact, BoinxTV can show screencasts from any part of your Desktop. This is a fantastic feature. 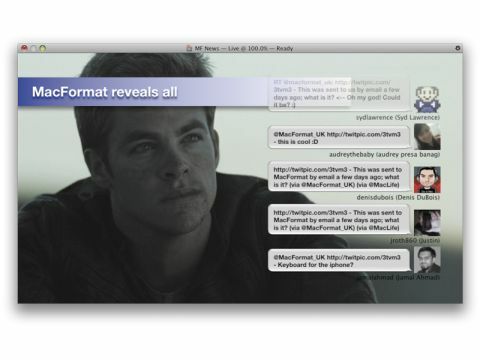 You could show your audience any video, website or OS X tip you like if you have an extended desktop. They're actually drastically underselling it. It's niggles like these that make us start to question BoinxTV's value, especially when you'd need to pay for GrabberRaster to stream live, and if you want pre-recorded segments you'd need something like Final Cut Express. BoinxTV does what it does very well, but some bizarre decisions and a need for further software harm it as a budget proposition.